Painting on silk, in its millennia-old traditional form and also in contemporary form, has become increasingly popular. With this guide, be inspired by nearly 500 images, visual demos, and aspects not covered in other books. Start with the basic skills and techniques, and move on to every element of the art, including everything from setting up your studio space, to painting on preconstructed clothing, to framing your art. Most importantly, enjoy learning unusual, innovative frames of mind to intensify your creative freedom, bringing new energy to your work. 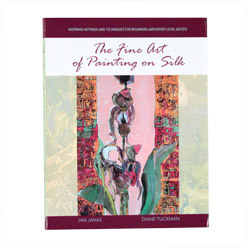 Authors Jan Janas, Diane Tuckman, founders of Silk Painters Internationals, give thorough guidance on how to push yourself out of your comfort zone to evoke emotions in your art.